CONCEPT V distributed by Zayre Corp. Size: 5.4" x 3.0" x 1.1"
The CONCEPT V calculator seems to be a Far East design of an unknown OEM (original equipment manufacturer). 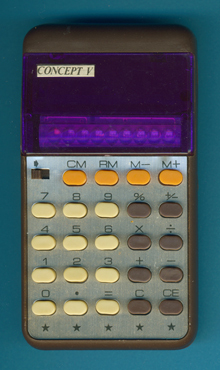 It was introduced in Summer 1977, just a few weeks before Zayre Corporation discontinued the CONCEPT calculator series. Dismantling this CONCEPY V calculator reveals a very simple construction centered around the Texas Instrumnets TMS0972 single-chip calculator circuit introduced already in 1975 and a LED display from the same manufacturer. © Joerg Woerner, February 5, 2010. No reprints without written permission.